Italy will contest their first-ever World final when their women, who beat USA by 7-6 in Saturday morning's semi-final, will play Canada, 10-2 semi-final winners over Sweden, in Saturday afternoon's gold medal final of the World Senior Curling Championships 2015. In the men's final, Canada, who beat Denmark by 5-3, will face USA, 9-4 semi-final winners over New Zealand. The Italian women were in control of their semi-final against USA from the start, scoring two points in the first end. They were 6-2 up going into the seventh end when, as skip Fiona Simpson said they "had a wobbly" and gave up four points to let USA level the game at 6-6. However, their fourth player Grazia Ferrero produced the shot of the session with her last stone - a lengthy straight raise take-out - to score one point for 7-6 and head for the final. In the other women's semi-final, Canada opened with a score of three points and then scored threes again in the third and fifth ends for a 9-2 lead. 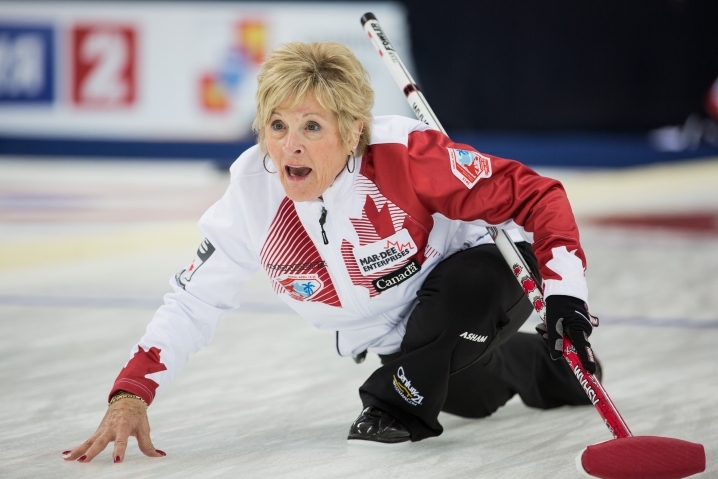 Swedish skip Gunilla Arfwidsson Edlund came up short with her final draw in the sixth end to give Lois Fowler's Canada a steal of one and a 10-2 lead, and the teams had not finished the seventh end when the Swedes conceded. In the men's semi-finals, USA opened against New Zealand with a score of three points and went into the fourth-end break 5-2 ahead. The killer blow came in the fifth end while USA stole four points for a 9-2 lead. This was too much for the New Zealanders to claw back and they conceded after scoring two more points in the sixth end, to give Lyle Sieg's USA team their 9-4 win. When Canada faced Denmark in the other semi-final, both were undefeated in the tournament so far. Canada opened with a score of two points in the first end but Denmark fought back level at 3-3 with a score of two points in the fifth end. In the sixth end, Canada's skip Alan O'Leary was short with his final draw but still managed to score two points from the end to take a 5-3 lead. Denmark then blanked the seventh end and O'Leary hit out a Danish stone in the eighth end to run Denmark out of stones in the end and claim the win.